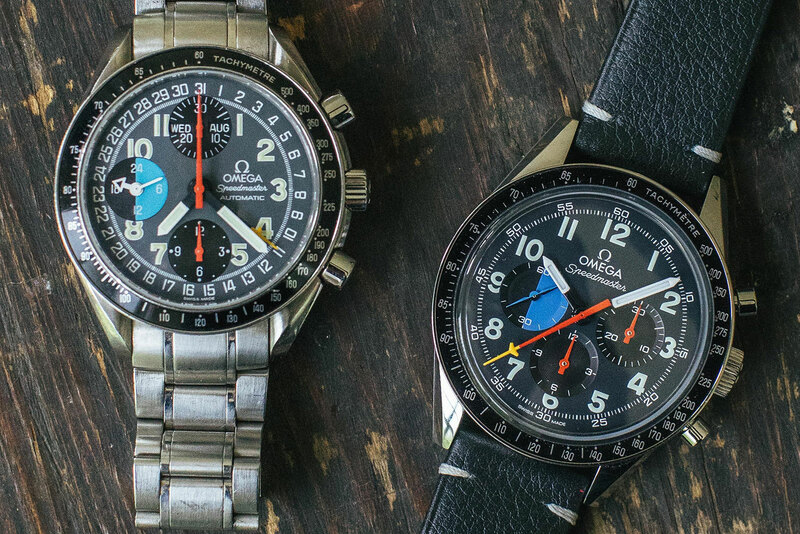 Founded a decade ago by Benjamin Clymer, New York-based watch blog Hodinkee has rapidly become a powerhouse of online publishing and retail. So it’s unsurprising that Hodinkee celebrates its 10th year with a limited edition with one of the world’s biggest watch companies that offers a new take on a historical timepiece. 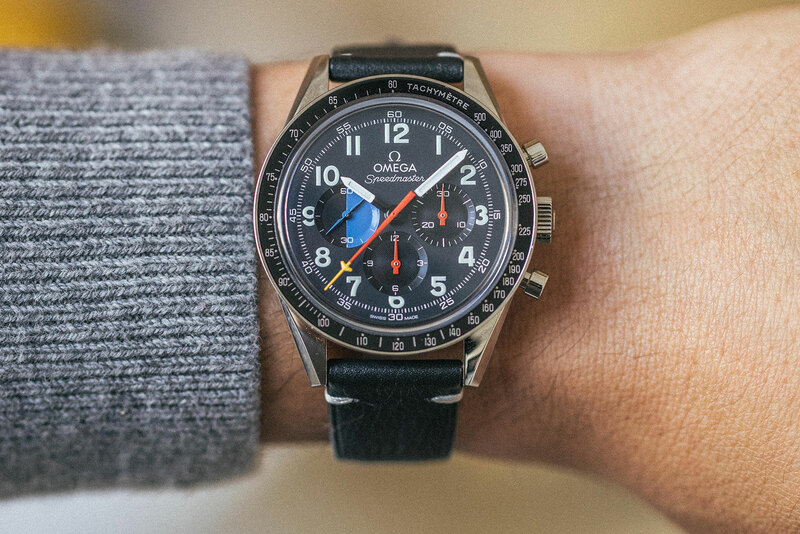 But the Hodinkee Speedmaster itself is actually a variant of the Speedmaster CK 2998 Moonwatch remake, with the same 39.7mm steel case, aluminium bezel insert and the hand-wound, Lemania-derived cal. 1861 inside. The blending of ingredients from both a Moonwatch and automatic Speedmaster is an unusual one in the Speedy universe, but imaginative and well executed. All the key visual elements of the “Mark 40” Schumacher have been retained, though some have been necessarily tweaked to suit the new movement. The date track on the original is now a 5-minute track, while the day and night indicator is a blue-black constant seconds register. And the twin central hands on the original (for elapsed seconds and the date pointer) have been merged into a seconds hand tipped with yellow “wings”. 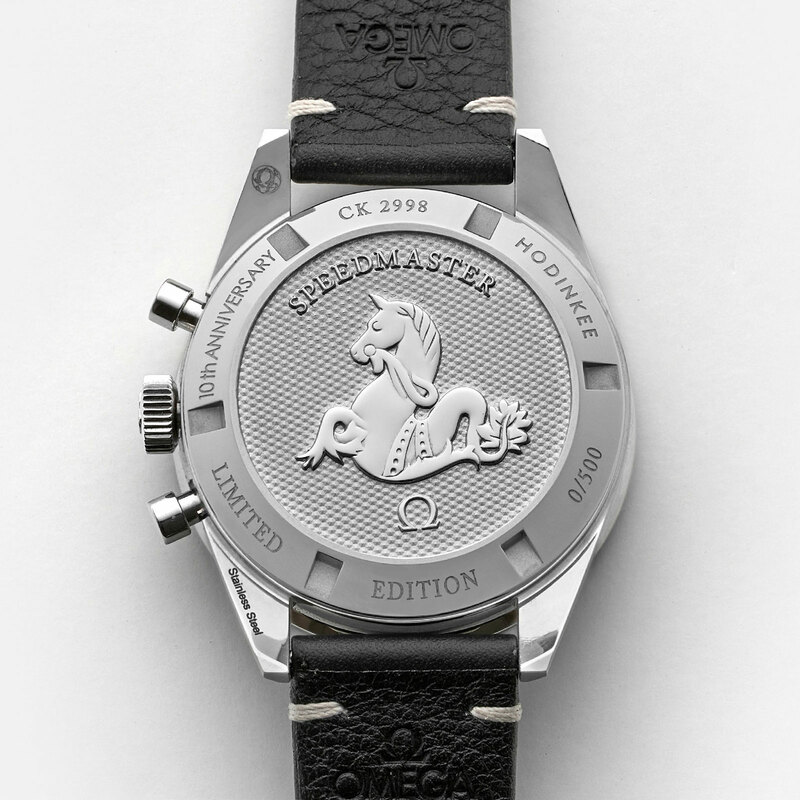 The Speedmaster Hodinkee 10th Anniversary has a solid back embossed with the Speedmaster seahorse emblem and engraved with commemorative text on its rim. 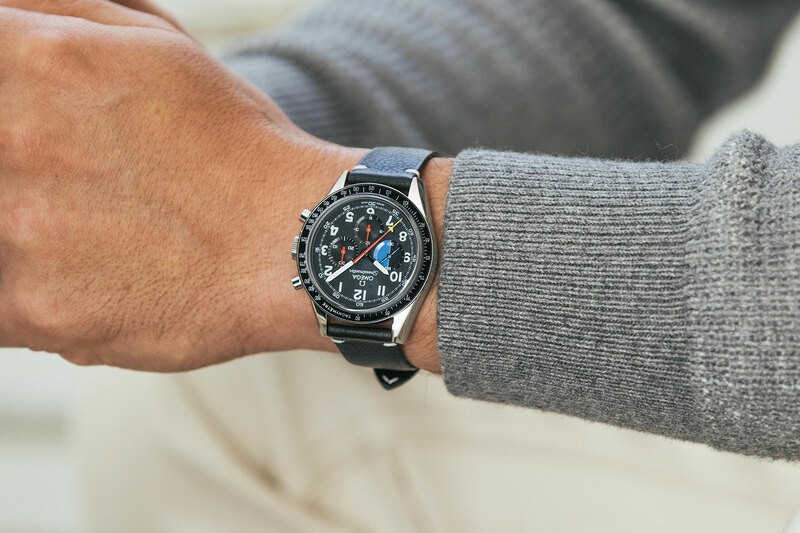 Delivered on a grey leather strap, the Speedmaster Hodinkee is accompanied by a grey NATO-style fabric strap and packaged in commeoriatve box that includes a spring bar tool and travel case. 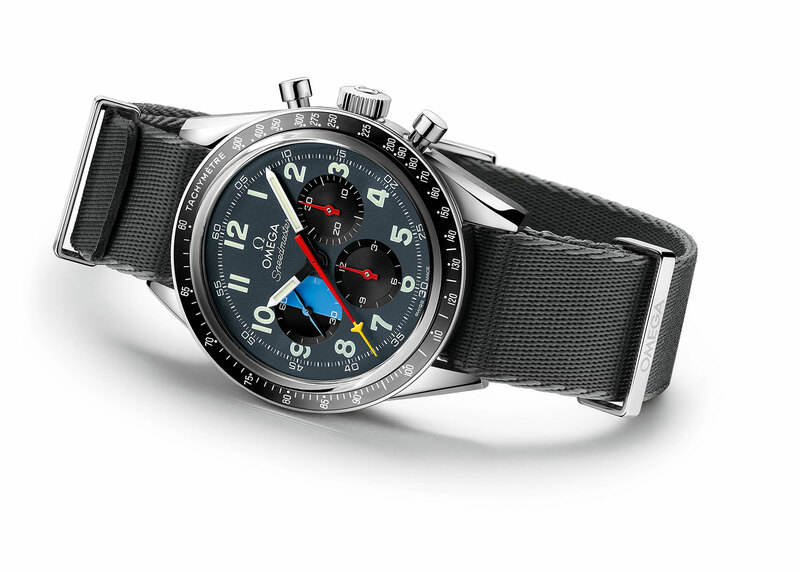 The Speedmaster Hodinkee 10th Anniversary is limited to 500 pieces, priced at US$6500. 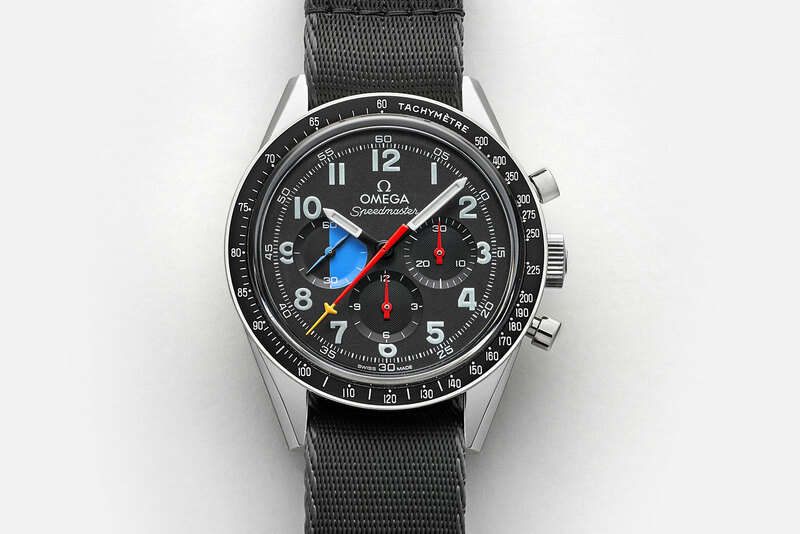 It’ll be available at Omega boutiques within the United States and also the Hodinkee shop online. Deliveries commence in November 2018.